Is Shade 61 (Mochaccino) right for you? 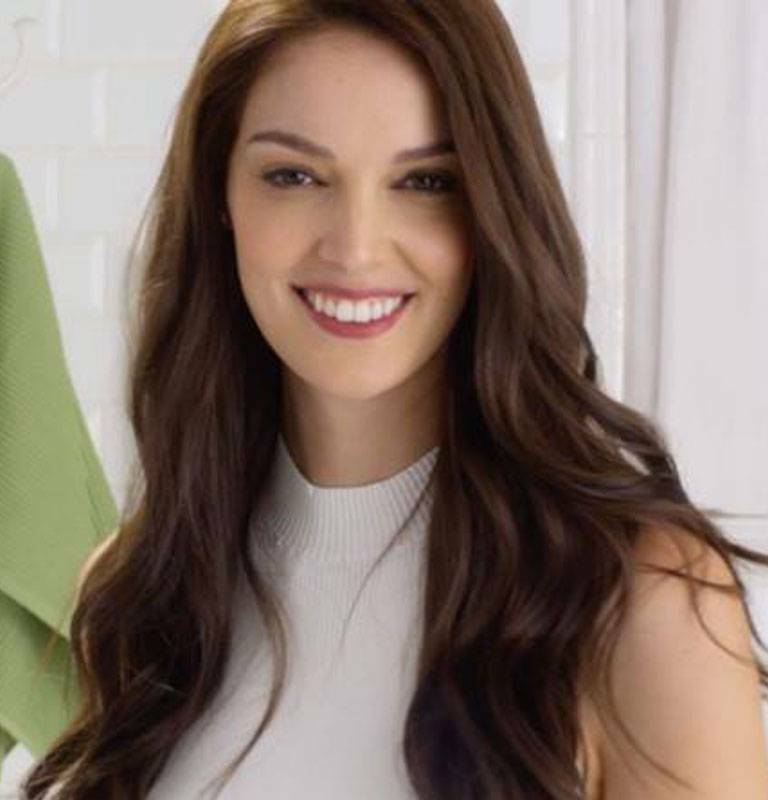 Garnier Nutrisse Light Ash Brown 61 (Mochaccino) is our light brown shade with cool tones that will counteract warmth, leaving you with a cool result while also providing 100% gray coverage. It is best for anyone with natural hair between medium blonde and dark brown. For a lighter shade with cool reflects, try shade 72 (Sweet Latte). For a darker shade, try 51 (Cool Tea). If you'd like to remain in the light brown range but would like to try other reflects and tones, there are many shades to choose from including 60, 63, 643, 66, and 69. *For women with currently color treated hair, there are special considerations for the color result you can achieve. 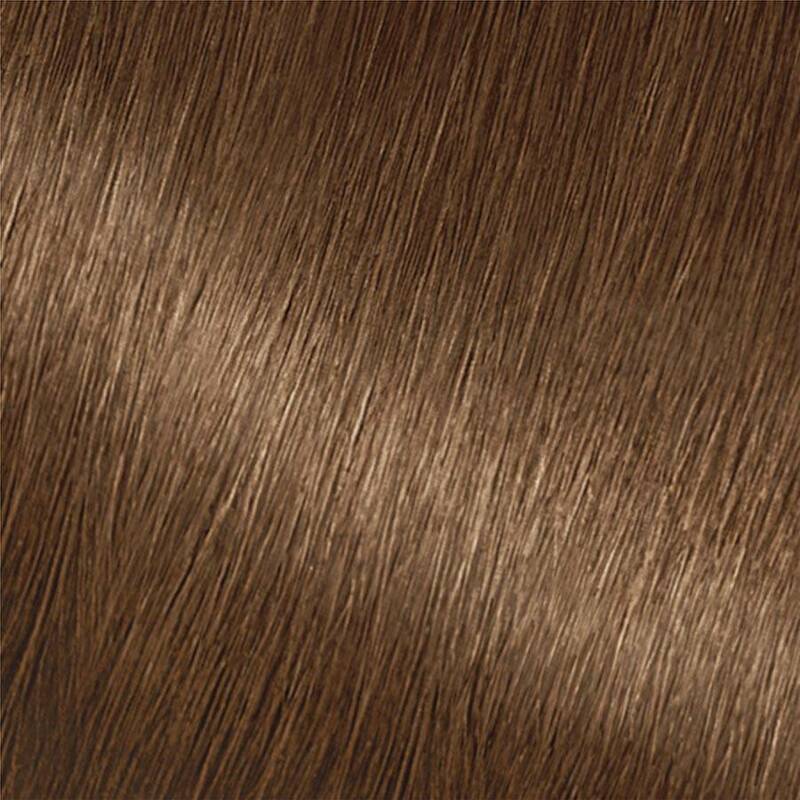 Because of this, we do not recommend shade 61 (Mochaccino) for hair that has been previously colored Dark Brown 40 (Dark Chocolate) or darker. For more help, use our Shade Selector Tool to find the perfect shade for you! Nutrisse Colorant: Aqua/Water, Cetearyl Alcohol, Propylene Glycol, Deceth-3, Laureth-12, Ammonium Hydroxide, Oleth-30, Lauric Acid, Hexadimethrine Chloride, Glycol Distearate, Polyquaternium-22, Ethanolamine, Silica Dimethyl Silylate, Ci 77891/Titanium Dioxide, 2,4-Diaminophenoxyethanol Hcl, M-Aminophenol, Ascorbic Acid, Sodium Metabisulfite, Dimethicone, Pentasodium Pentetate, N,N-Bis(2-Hydroxyethyl)-P-Phenylenediamine Sulfate, P-Phenylenediamine, Parfum/Fragrance, Carbomer, Resorcinol, Vitis Vinifera Seed Oil/Grape Seed Oil. F.I.L. D42746/2. Fruit Oil Concentrate: Paraffinum Liquidum/Mineral Oil, Vitis Vinifera Seed Oil/Grape Seed Oil, Parfum/Fragrance, Tocopherol, Rosmarinus Officinalis (Rosemary) Extract. F.I.L. D25829/5. Rinse-Out Conditioner: Aqua/Water, Cetearyl Alcohol, Elaeis Guineensis Oil/Palm Oil, Behentrimonium Chloride, Pyrus Malus Extract/Apple Fruit Extract, Glycerin Parfum/Fragrance, Stearamidopropyl Dimethylamine, Niacinamide, Pyridoxine Hcl, Butyrospermum Parkii Butter/Shea Butter, Citric Acid, Olea Europaea Oil/Olive Fruit Oil, Saccharum Officinarum Extract/Sugar Cane Extract, Benzyl Alcohol, Chlorhexidine Dihydrochloride, Persea Gratissima Oil/Avocado Oil, Ribes Nigrum Oil/Black Currant Seed Oil, Linalool, Citrus Medica Limonum Peel Extract/Lemon Peel Extract, Ci 19140/Yellow 5, Camellia Sinensis Extract/Camellia Sinensis Leaf Extract, Ci 15985/Yellow 6. F.I.L. D35637/3. Nutrisse Developer: Aqua/Water, Hydrogen Peroxide, Cetearyl Alcohol, Trideceth-2 Carboxamide Mea, Ceteareth-25, Glycerin, Pentasodium Pentetate, Sodium Stannate, Tetrasodium Pyrophosphate, Phosphoric Acid. F.I.L. D12836/26. Rated 5 out of 5 by Vita from Does not cover gray I love the color that I get from Nutrisse LIght Ash Brown, super gentle on my scalp and hair, the color has beautiful highlights but some grays were not covered. Rated 1 out of 5 by Patty15 from Very disappointing Used this product as directed. First, it NOT cover any grey hairs of which was the primary purpose of coloring my hair. Also, it lifted my dark brown hair at the roots to a very unnatural orange color. My mid shaft and ends were lifted slightly less than the roots. Overall, this hair dye ( light ash brown) was very dissappointing. There was no ash in this color. I have very fine hair that is prone to breakage and I will have to redamage my hair with another color to fix this one. 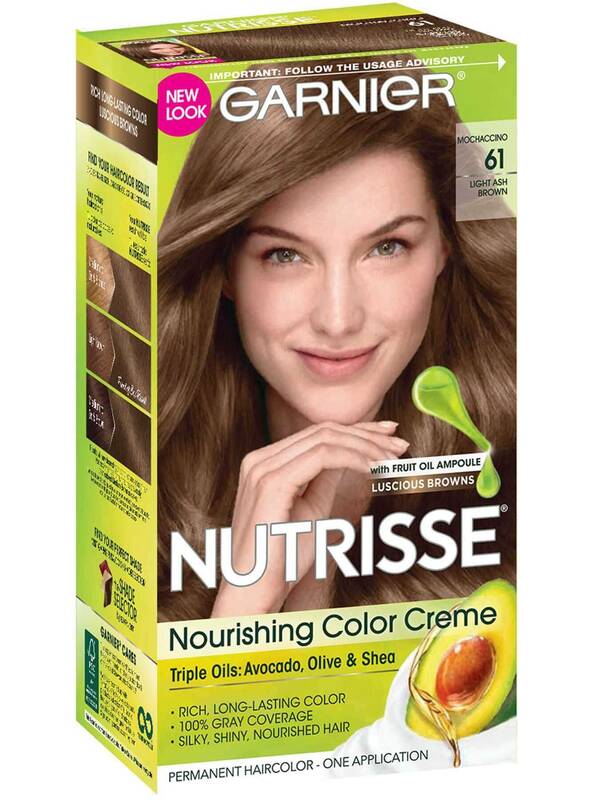 Rated 4 out of 5 by Sandy_12345 from Garnier Nutrisse 61 Colored most of my as expected and it even covered my grays, but I have lighter tones at the bottom half of my hair which acquired a green tone. I knew this would happen but I am wondering if you carry a similar color that can help me correct this? Rated 1 out of 5 by Sarah2007 from Poor Grey Coverage I have some grey hairs (not a lot) at roots. This product claims to cover 100% grey hairs but unfortunately did not cover the majority of mine...it also left my hair looking very brassy and I didn't buy a toner because since the color is light "ash" brown, I didn't think I would need one. Anyway, I'm mostly upset that my grey hairs were not covered which is the main reason I was dying my hair...would not recommend. Rated 1 out of 5 by Dantschi from So disappointed I also tried the very light ash blond and was very happy with my results! When I decided to go back to my old hair color I got so disappointed!!! My roots got lighter again and I got the same color as when I dyed my hair with the very light ash blond. Rated 1 out of 5 by Learn my lesson from Very disappointed. Didnt work. Very disappointed. I wanted to try light ash brown color. And i decided to go with Garnier as it said 100% gray coverage. My hair color is black with light grey hair. It came out as - my grey still there after leaving it for 20 mins for root cover up and another 10 mins for the rest per instruction. - result : the root is a lot lighter than said on the box and no chance to the rest of my hair. So, i have black, grey, dark ash brown and light ash brown all in 1 head. I wasted my time to dye my hair and very disappointed in the result.